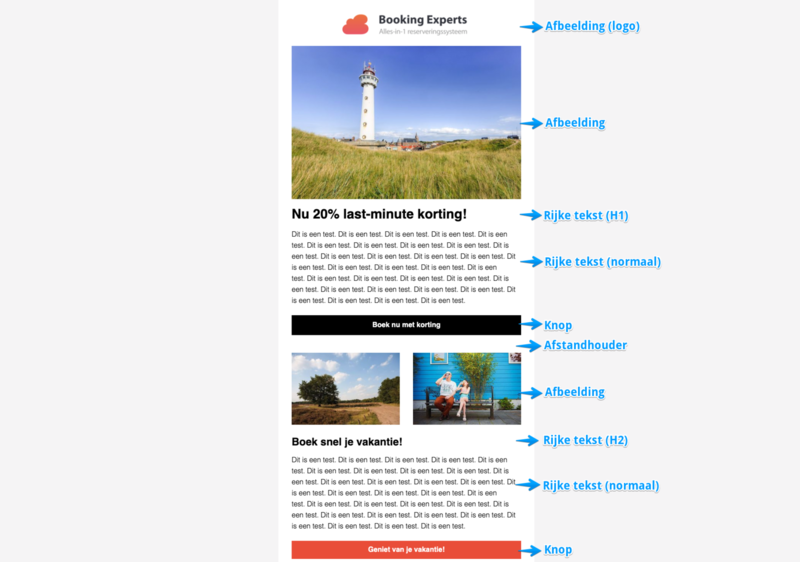 You can send newsletters/e-mails to your (future) clients via the Booking Experts e-mail campaigns. To do this, you will first have to import the e-mail addresses to send the newsletter to. 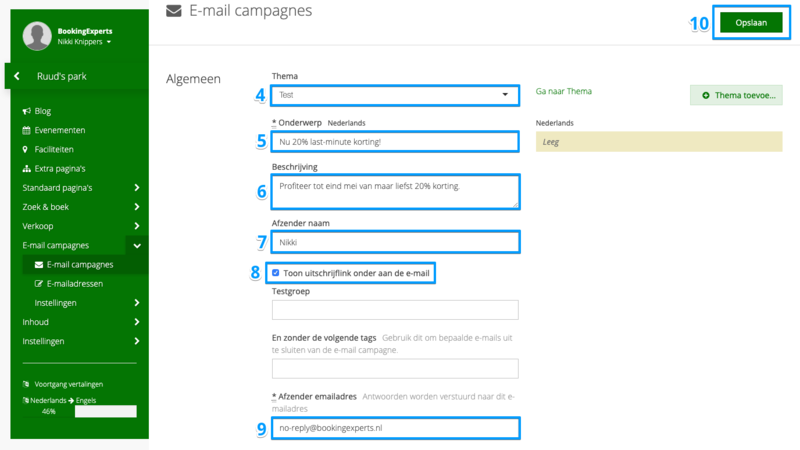 Then, you create an e-mail campaign in five steps. First, create an e-mail campaign and enter the important information. 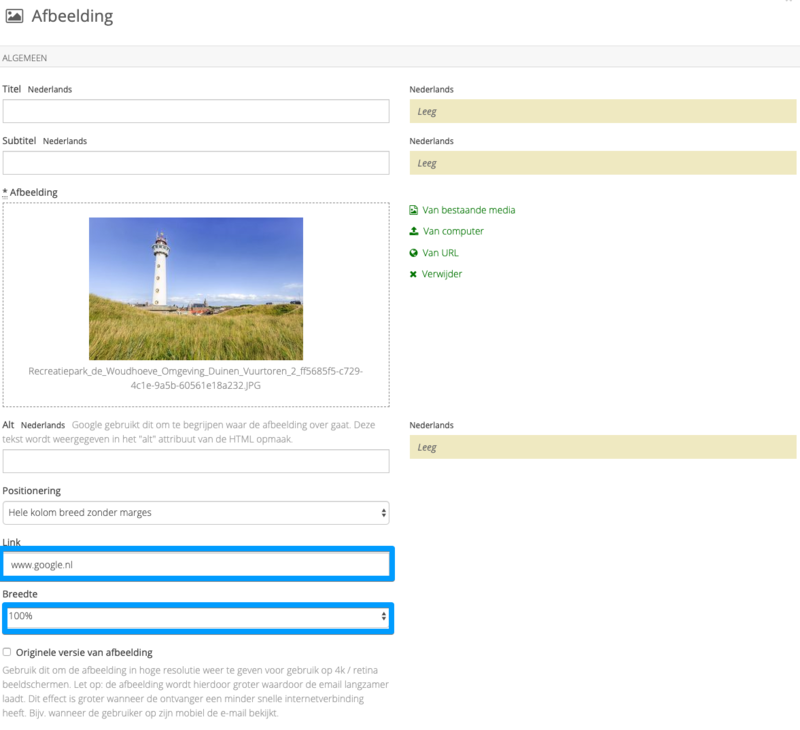 Here, you can enter your own name or the name of your company. Tip: use your own name, this comes across as more personal and it works better. 8. Check Show link for unsubscribing at the bottom of e-mail, so your recipients have the choice to unsubscribe from future e-mails. 9. Enter the address to which replies can be send at Sender e-mail address. Enter the titles and texts for your newsletter here. Add images to your newsletter. Tip: enter a URL at Link, so readers will be redirected to your website when clicking an image. 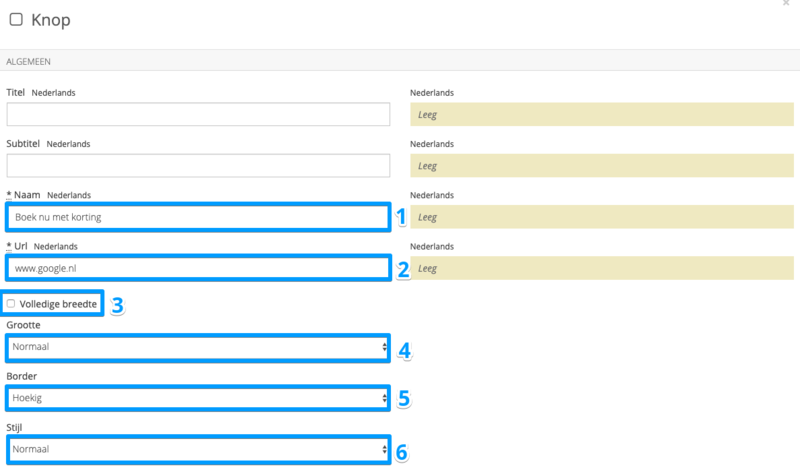 Determine the size of your image in the e-mail at Width. 1. Name: text on the button. 2. URL: URL of your website. 3. 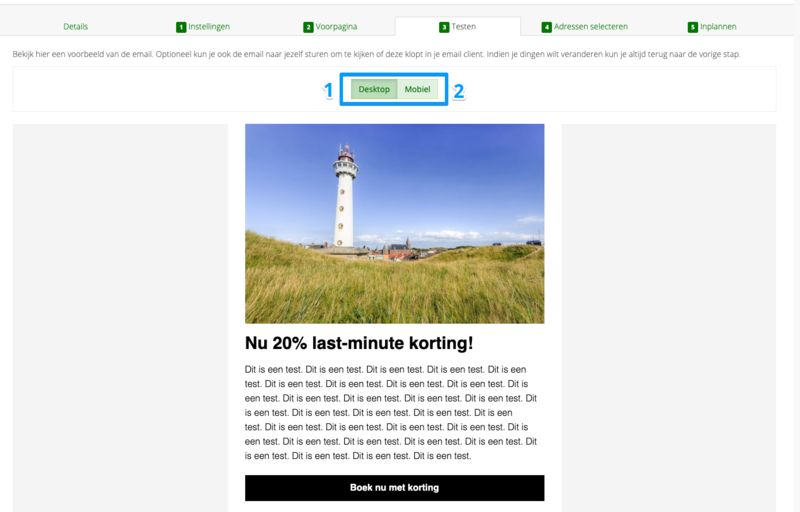 Full width: button spanning the full width of your newsletter. 4. Size: size of the button. 5. Border: shape of the button. 6. Style: color of the button. 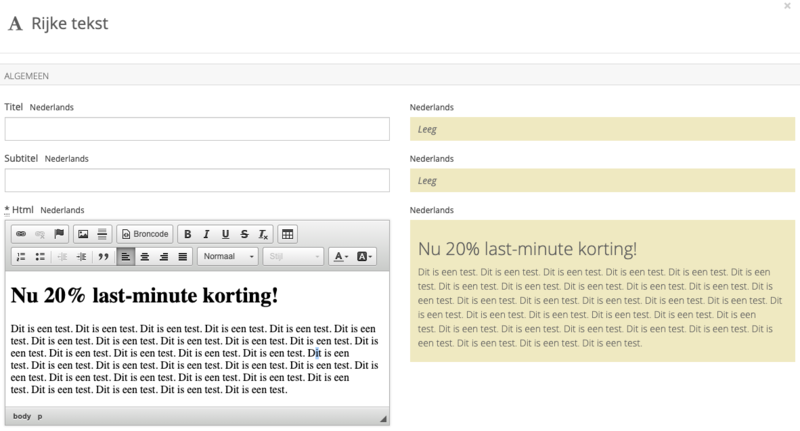 Use a spacer to create a blank space between widgets. Point out your social media channels. This is usually shown on the bottom of a newsletter. By clicking Preview in the top right, you can see what your widgets will look like on the front. This gives you an image of what your e-mail campaign will look like. When you are happy with it, click Save and continue to next step. Write short newsletters with 2 different subjects at most. Start with your company logo at the top. Make use of the H1 and H2 for headers and sub-headers. Use lists for readers who quickly scan the newsletter. 3. Send a test e-mail to yourself or a test group. If you leave Test group blank, the e-mail will only be sent to you. Then click Send a preview to the following test groups and continue to the next step. Happy with your e-mail campaign? Select the e-mail addresses to send the e-mail to. This can be easily done by using the tags you used for the e-mail addresses. 3. Click Save and continue to the following step. Lastly, you will plan when the e-mail campaign is to be sent. You can choose between now and at a later time. 1. Now: you will send your e-mail campaign at this moment. 2. At a later time: select a date and time to send the e-mail. The e-mails will be automatically sent on that date at that time.